The "woman-in-peril" melodrama is a popular subgenre of film that fell neatly under the banner of the "woman’s picture” of the ‘30s and ‘40s. Early films in this mold (Rebecca - 1940, Suspicion - 1941, Gaslight -1944) combined aspects of the horror film, film noir, and the romance gothic in suspense narratives with female protagonists bedeviled by dashing and desirable men who, under normal circumstance, would be considered the romantic ideal. In the postwar years, when Hollywood took to aggressively reinforcing more traditional gender roles, these sophisticated romantic dramas became decidedly more domestic in focus (Loretta Young in 1951s Cause for Alarm, Doris Day in 1956's Julie - the original "The stewardess is flying the plane!" thriller), and more conspicuously tailored to appeal to a female audience. The relative dowdiness of these black & white suburban suspense thrillers eventually gave way to the tonier, full-color escapism of a the “posh women in peril” subgenre. Here, the aproned housewife of yore was replaced by the moneyed lady of leisure, therein offering the added diversions of fashion show and travelogue to the mix as these well-turned-out heroines were photogenically menaced in delectably plush surroundings. To this latter category belongs producer Ross Hunter’s Midnight Lace, an appealingly glossy, routinely effective, thoroughly predictable woman-in-peril melodrama graced by a persuasively committed performance by Doris Day. A Gen-X prototype. The entitled, ne'er-do-well son of the Preston's Dickensesque housemaid. Silent skulker who might as well wear sandwich board reading "Suspicious Character"
Thrill at the splendor of the ballet! Featuring excerpts from Giselle, Petrouchka, and Swan Lake! Even Don Loper would swoon over the magnitude of marvy millinery on display! Midnight Lace is the kind of movie you can imagine Lucy and Ethel taking in at a matinee after luncheon at Schrafft’s (with hats! ), then talking animatedly about Doris Day’s gowns and the relative “dreaminess” of Rex Harrison and John Gavin as they take the train back to Westport. Striking a note of violent hysteria even before the credits roll, Midnight Lace wastes no time getting underway, swiftly setting a wobbly foundation of emotional instability for Doris Day’s harried heroine to hurl herself from. As American heiress Katherine Preston, Day plays a newlywed “work widow”: a lonely London expatriate three months married to a British financier (Harrison) whose unforgiving work schedule leaves her with far too much free time. Too much time to roam the unfamiliar city alone; too much time to grapple with the confusing monetary exchange rates; and (as per the plot) too much time to fabricate phantom assailants in an effort to garner the attention of her neglectful husband. Though the film makes us privy to the fact that she is indeed the target of threatening phone calls and a series of near-fatal mishaps, Kit’s nervous excitability, combined with a septet of vaguely suspicious supporting characters, conspire to create just enough doubt as to whether Mrs. Preston is the victim or the agent of her torment. When one settles down to watch a film like Midnight Lace—the motion picture equivalent of those paperbacks you buy at drugstores and airport gift shops for the sole purpose of reading poolside or on the beach—certain rules must be applied: you either surrender yourself to its contrivance, artificiality, and slavish adherence to form, or else you’re simply better off watching something else. In order for films like this to work, a ringing phone has to be treated like a summons from the Queen: it simply cannot be ignored. Friends and loved ones know you're being harassed by a phone maniac, so of course they will be placing calls to you at regular intervals. And it goes without saying that just hanging up on the pervert is never an option. Not when the victim can ask the same question over and over again ("Who IS this?!?") certain that the 12th entreaty will yield a result different from the 7th. But the necessity to check your brain at the door doesn’t mean one can’t simultaneously marvel at the manner in which the entire plot of Midnight Lace hinges on and is propelled by the Freudian fear (and subsequent dismissal) of the “hysterical woman,” complete with its psychological tie-in to sexual frustration. Midnight Lace was adapted by two male screenwriters from the play Matilda Shouted Fire by British playwright Janet Green. Green was co-writer of two of the UK’s most influential “social problem” films: Sapphire- 1959 (racism) and Victim -1961 (homosexuality). I have no idea how closely the motion picture hews to the original play, but I suspect the entire enterprise would clock in at roughly 23-minutes had it dispensed with the presupposition that women are inherently emotional creatures, strangers to logic, and prone to coming unglued under stress. Midnight Lace's overweening patriarchal tone—apparent in the galling level of male condescension Day’s character has to contend with—would all seem rather quaint and easy to shrug off with a “That’s how it was back then,” were it not rooted in a “protect women from themselves” cultural mindset that persists today (Google search: Roomfuls of wizened, Viagra-dependent old farts legislating women’s bodies). In spite of its creaky sexual politics, Midnight Lace is a surprisingly watchable little thriller that shares a lot in common with another of my favorites, Elizabeth Taylor’s sole foray into the suspense thriller genre, 1973s Night Watch. In both films a neglected wife’s claims of being terrorized are met with both suspicion and disbelief by male characters. In each film the women are driven to the brink of hysterical madness, suspected of fabricating an emotional crisis out of a neurotic response to loneliness. The similarities in plot and tone are intriguing, but the more contemporary feminine perspective of Night Watch (another film adapted from a play written by a woman) recognizes and incorporates the sexist tropes of the woman-in-peril genre and subverts them to startling effect. In Midnight Lace, Doris Day’s natural delivery and grounded, level-headed bearing works miracles with the film’s artificial dialogue and contrived plotting. No matter what histrionics the script requires of her, Day's innate well-adjustedness prevents her character from appearing neurotic or unhinged. Indeed seeing such a healthy, uncomplicated screen persona crumble under pressure give her scenes of torment an unsettling authenticity. No pretty "movie star" screaming here. Day cries, wails, and lets out with guttural sobs that are positively heart-wrenching. The movie itself may be a tad overwrought, but I find nothing lacking in Doris Day's impeccable performance. In her memoirs, Doris Day recounts that for this scene she channeled memories of the abuse she suffered at the hands of her first husband. So successful was she at working herself into a state of near-hysteria, Day actually suffered something of a breakdown and the production had to be briefly shut down. Midnight Lace is an old-school Hollywood “movie” movie at its best. If you have a taste for such things, these last-gasp studio-system entries before Hollywood shifted to experimentation and naturalism can offer many amusing diversions. For instance, I'm convinced the film was shot on a soundstage and backlot, it's that artificial-looking, but a few (second-unit?) shots look as though could actually be taking place in London. Similarly, for a film of this period, I was impressed with the color photography. At a time when flat, overlit sets were the order of the day, Midnight Lace’s cinematography (Russell Metty, Oscar winner for Spartacus) has a richness and depth that makes marvelous, atmospheric use of shadows and color. It's one of those movies where everybody is always being offered a drink, women sleep in full makeup, and there is no such thing as dressing casually. And of course it’s difficult not to giggle every time a scene is contrived to be filmed in longshot so as to better showcase one of Day’s many lovely, matronly costumes. I really think I have to reassess my longstanding indifference to Roddy McDowall. Cropping up on this site in no less than seven films, I'm starting to not only grasp that he was the Kevin Bacon of his time--appearing with practically everyone in Hollywood at one time or another--but I see that what he lacked in versatility, he more than made up for in dependability. He consistently turns in solid (albeit, one-note) performances in one thankless role after another. These days I'm not really sure what condition the woman-in-peril film genre is in (my hunch is that TVs Lifetime Network pretty much wore it into the ground), but 1960s Midnight Lace stands as a high-style entry with plenty of retro appeal, and boasts Doris Day giving one of her best dramatic performances. Forget that it was originally targeted to female audiences, this Lace is one size fits all. Midnight Lace's sole Academy Award nomination went to the costume designs by Irene (Lover Come Back). Universal made available to theaters a promotional featurette titled High Style Elegance showcasing Doris Day modeling the many costumes from the film. Along with fashion-centric ads placed in national women's magazines, the featurette was intended to inspire hoards of female theater patrons to stampede their nearest department store and demand it stock the Irene, Inc. line of Women's Wear. Here Ms. Day models a leopard-print crowd-pleaser that never made it into the finished film. Watch the featurette (German soundtrack) HERE. For a time in the 1980s, it seemed as though the only "liberated" profession writers could think of for a woman was TV reporter. 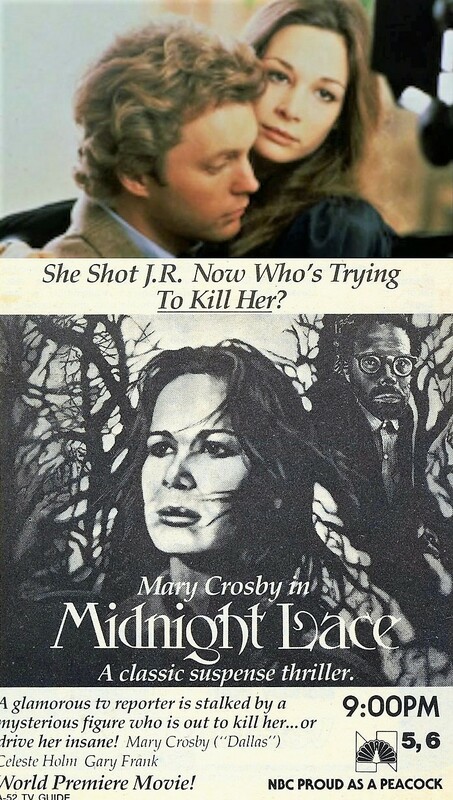 Here, a year before Morgan Fairchild (Flamingo Road) portrayed a TV reporter terrorized by a stalker in the feature film The Seduction (1982), Dallas's Mary Frances Crosby played a TV reporter terrorized by a stalker in a truly wretched 1981 remake of Midnight Lace. Its plot retooled to dispense with a great deal of the original's patriarchal tone (along with a great deal of the original's coherence); in its place is almost unwatchable mediocrity and tedium. Those with a masochistic streak and taste for the obscure can catch this thrill-free thriller on YouTube while you can. Well, it’s been several years now and Remember My Name seems no closer to seeing the light of DVD day; so fuzzy screencaps, here we come. Remember My Name is a moody, disconcerting, not-to-everyone’s-taste update of the classic 1940s women’s melodrama. Not to everyone's taste in that this Altman-esque neo-noir (it was written and directed by Robert Altman protégé Alan Rudolph) takes its time and resists standard genre structure in dramatizing an exploration of the femme fatale mystique through a distinctly ‘70s, decidedly feminist prism. When I was growing up, movie theaters screened films in “continuous performance.” This simply meant that movies (usually double or triple features) were screened continuously throughout the day, often without benefit of intermissions, and patrons were free to come and go as they wished. What this meant for me and my three sisters—the eldest harboring a near-manic aversion to coming in on a movie already in progress—was that every trip to the movies involved an elaborate lobby ritual built around ensuring our not hearing or catching a glimpse of the ending of feature #1, yet making certain we were in our seats in enough time for the start of feature #2. When arriving at a theater before movie #1 had ended, my elder sister would insist we stand in the lobby—balancing our popcorn, drinks, and candy—assigning a reluctant electee (me) the task of periodically peeking through the slats of the auditorium double doors, so as to be on the lookout for scrolling end credits: this being the sign to give my sisters the “thumbs up,” indicating that the coast was clear and it was at last safe for us to enter a spoiler-free environment. Most times things proceeded without a hitch, for when I was on my game, I was practically the Sherlock Holmes of listening without hearing and watching without actually taking any information in. I was a crack at discerning end-of-movie themes and gauging the length of closing credits. However, once in a rare while my technique was gummed up by those deceptive films which crowd all their credits into the opening, thereby ending on a lone “The End” title card or silent fade-to-black. On one such occasion I suffered such an error in judgment that, in mistaking the opening credits of film #2 for the closing credits of film #1, I gave the signal to my sisters only after the second feature had already BEGUN. Yes, for all our waiting and stealthy machinations, thanks to me we all wound up missing the beginning of the movie (all sixty seconds of it, I might add). Nevertheless my sister was livid. In fact, had she been able to devise a reasonable explanation to offer our parents for my absence, I’m certain she would have pushed me over the theater’s balcony that day. I too always prefer to see a movie from the beginning, but in instances where it can’t be helped, I find there to be something uniquely enjoyable in trying to pick up and assemble the threads of a film’s plot from the middle working backwards. To, in essence, play “catch up” with the events of a film; taking bits of plot and character information revealed out of context in the present, and ascribing to them, in reverse order, a kind of imagined order and motive. This phenomenon is used to great effect in this, Alan Rudolph’s second film (his first being 1976s Welcome to L.A.), for like a lot of good movies and most great mysteries, Remember My Name feels like a story we’ve picked up in the middle. The film opens with the image of a lone, late-model car winding down a California highway mountain road. Its driver: a slight, flinty-looking woman in dark glasses who, when glimpsed roadside with her ever-present cigarette, is revealed to be dressed in the drab khaki and blues of institutional clothing. Is she an ex-convict…a parolee…an escapee from an asylum? At this point we don’t know. What we do know is that she is following a man in a car. Very closely and very intently. When the man arrives at his destination—a residential construction site—the woman of mystery lags behind, affording him time to exit his vehicle. As she drives slowly past, she pauses just long enough to give two blasts of her horn; an act which both draws attention to herself, and elicits from the man a response betraying something deeper than the rattled curiosity over the identity of a stranger in a car. Things really start to percolate when we at last get a good look at the stranger (sort of, for her eyes are obscured by large aviator sunglasses) who, as it so happens, is in the process of making a harassing phone call to an unidentified woman. What these three individuals have in common, if anything, has yet to be discerned. But in plopping us smack dab in the middle of what already feels like a situation fraught with portent, Remember My Name intensifies our desire to know who these three people are, what their history is, and how their lives intersect. As its mystery unfolds, Remember My Name reveals itself to be a suspense thriller set in the present, about three people intent on building a future, yet confronted with the inconvenient reality that they must first come to terms with their pasts. Emily (Geraldine Chaplin) has just been released from prison after serving 12 years for involuntary manslaughter. Rarely far from a cigarette, walking furtively about with downcast eyes, arms pinned to her sides, muscles-coiled and body braced for either attack or defense; Emily navigates open spaces as though still behind bars. Clearly unversed in the relaxed give-and-take of casual conversation, she speaks in the blunt and deliberate manner of one accustomed to only answering questions. But if the outward appearance of Emily’s actions offer the superficial reassurance of an ex-convict making a sincere effort to adapt to society—in rather rapid order she purchases new clothes, lands a cashier’s job at a Thrifty Mart, snags a seedy downtown apartment, and undergoes a curiously hyper-femme makeover (getting an elaborate bouffant hairdo perhaps more in vogue back in the late ‘60s when she was jailed)—one can’t also help but detect in it all, an air of impermanence. For in her private moments, moments dedicated to reciting well-rehearsed, melodramatic speeches; re-acclimating herself to high heeled shoes; and practicing feminine poses of seduction; it’s obvious that Emily’s single-minded determination is less about personal reform and adapting to freedom, but more about settling a score with construction worker Neil Curry (Anthony Perkins) and his wife Barbara (Berenson). With a vengeance. I suppose I always get such a kick out of revenge thrillers because in real life, investing so much effort in “getting back” at someone really is such an exhausting and colossal waste of time. But as vicarious thrills go, Remember My Name ranks high on my list of movies that traffic in what I call The Theater of Methodical Payback. These studies in self-help justice are so engrossing because, as structured, they tend not to clue you in on the “whys” of the revenge plot until well after you’ve come to know the characters. By the time all is revealed, the viewer—in coming to know and/or identify with these individuals—has hopefully come to develop an emotional investment in the outcome. No longer mere voyeurs, we now have a stake in the proceedings: do we want to see Emily triumph, or do we hope her plans will be thwarted? Is Neil really guilty of anything? Is Barbara an innocent party? Many questions come to mind, but one of the sharpest knives in Remember My Name's drawer is its ability to make you think you know where things are headed when in fact we're merely being prepped to be thrown another curve. During the nostalgia-crazed ‘70s, several filmmakers used the public’s preoccupation with all things retro (with all its inherent desire to escape into an imagined “simpler” past) as an opportunity to comment on contemporary times. Certainly Robert Altman's Philip Marlowe update The Long Goodbye (1973) and Robert Benton’s nourish The Late Show (1977)...also produced by Altman...made everything old feel new again. But to my recollection, Remember My Name was the only film from this era to take on the neo-noir from a female perspective and devise an modernized spin on the once-popular “woman’s film” genre of the 1940s. Remember My Name offers provocative commentary on issues of masculinity and femininity. Some of it intentional: as in the mannish/aggressive behavior Emily exhibits intermittently with the studied, mannered femininity she adopts when she sets about using the male gaze to her advantage. 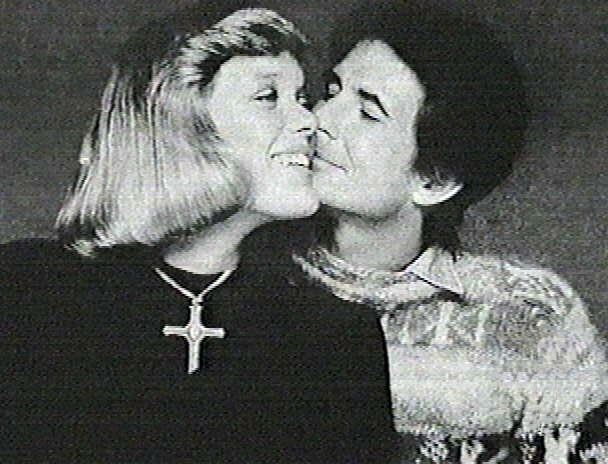 Some of it unintentional: the pairing of the bisexual Perkins with real-life wife Berenson in her film debut makes for a curiously androgynous couple, their male/female similarity adding to the film's gender provocation. In Geraldine Chaplin’s Emily, Remember My Name has a female anti-heroine at the center of its narrative. A complex, inarticulate study in contradictions; she’s hard and soft, pitiable and terrifying, understandable and opaque, protagonist and villain. Emily operates under her own instincts, agency, and agenda, none of which is ever made fully clear to us. The thrill of watching her, in all her unstable unpredictability, is that her actions alone propel the entirety of the plot. She’s the reason it starts, and she’s ultimately the one who decides how it ends. Remember My Name is a character drama cloaked in a genre film. What Alan Rudolph’s moody screenplay (in no great hurry to get to where it’s headed) and eye for character detail does is place very unexceptional people in the extraordinary, heightened-reality framework of film noir, then sits back (there’s that leisurely thing again) as they struggle to cope with how little effort it takes for the bedrock of simple lives to be demolished. For the viewer, this ordinary/extraordinary contrast creates a subtle tension born of wanting the story to flow and progress along the traditional lines and tropes of the genre, only to have one’s expectations provocatively subverted at every turn due to the erratic idiosyncrasies of the characters and the near-certain combustibility of their interactions. There’s Jeff Goldblum as the harried manager of a thrift store who employs the ex-cons his mother recommends (she's incarcerated for killing his father); Alfre Woodard (making her film debut) as Goldblum’s suspicious assistant, a snooping agitator who has no idea what she’s taking on by wrangling with the volatile Emily; and Moses Gunn as Pike, the brusk building manager with whom Emily forges something resembling a relationship—or at the very least, the closest thing to a relationship her sealed-off heart will allow. And then of course there’s Barbara and Neil Curry, the focus of Emily’s obsessive harassment. Anthony Perkins’ Neil seems an Average Joe type, but there’s something a bit off about him (it IS Anthony Perkins, after all). In an instance of an actor’s real-life discomfort in his a role working to a film’s advantage--Perkins felt he couldn’t convincingly play a construction worker, and he’s right--Neil comes across as a person attempting to hide something unsavory about his past in the adoption of a new persona that’s an ostentatiously ill fit. As ill-fitting as his marriage, it would appear. For while no mention is made of how long they’ve been together (Neil’s plans to build the two of them a cabin hint of being somewhat-newlyweds), cracks are already beginning to show in the relationship, evident in Neil’s prolonged absences and Barbara’s perpetual bewilderment at his behavior (alas, the sole character trait afforded Berry Berenson’s character). In Remember My Name, a film that can be looked upon as a kind of cynical treatise on love as life’s ultimate natural disaster (earthquake reports play incessantly on TV sets in the background); no relationship is easy, no associations are clear-cut, and in the end, a woman may find it necessary to toughen up in order to save herself from the collateral damage of romance. This is my absolute favorite of all Geraldine Chaplin’s screen performances. In fact, I’d rate her Emily as one of the most memorable, intriguing characters written for a woman. Movie femme fatales come in all stripes. Most, regrettably, embodying some aspect of men’s fear of women. A great many of these films ask us to view the femme fatale from the lead male character’s perspective. What I find so fascinating about Emily and Chaplin’s intense, internal portrayal, is that, in being a study in contradictions, she belongs to no one but herself. You can try to peg her as a villain/victim, hard/vulnerable, insane or determined; but at every turn she resists pigeonholing. Eventually you’re forced to surrender your expectations and all those familiar names attributed to women in these kinds of movies, and simply let her character be who she is. In the end, you may come away with a name for the type of woman Emily is revealed to be, but it’s a conclusion arrived at by knowledge, not assumption. Chaplin fleshes out her character with unique depth. So compelling I can’t imagine anyone else in the role. She’s terrific. Appropriately enough, my introduction to Alan Rudolph was his first film, Welcome to LA. Unfortunately, all that I found enjoyable about that very Altman-like look at Los Angeles bed-hopping was marred by how unbearable I found Richard Baskin’s music (I find it to be so hard going that when I watch it, it's either with my remote at the ready so I can mute it, or with the sound completely off, reading the subtitles). Rudolph's second film is considerably more to my liking and tastes, for while music still figures prominently in Remember My Name, it's jazz, which I like, and the songs composed and sung by Alberta Hunter serve as the eloquent emotional voice of the film’s inarticulate and closed-off characters. I can’t say enough good things about Remember My Name, a smart, emotionally honest film of sometimes confoundingly complex characters and relationships. Rudolph directs with unusual flair and the film is punctuated by stylistic touches enhanced by Tak Fujimoto’s descriptive cinematography. Emily is haunted by the sound of cell doors closing (it's the very first sound we hear, before the Columbia logo is off the screen). Bars become a motif throughout the film, suggesting imprisonment, confinement, and emotional distance. And for those in search of a motive for Emily's revenge, I think it can be found in the film's title Remember My Name, which to me shares an intersectionality sisterhood with the current hashtag social movement #SayHerName devoted to raising awareness of black female victims of violence and police brutality. Too often in our culture, women are labeled the victim, the wife, the girlfriend, the ex; etc. When a woman demands that her name be remembered (or spoken) it's a demand to be humanized and not dismissed or marginalized. I like to think that Emily's quest is simply the insistence not be easily swept into the past. And based on how the film ends, there's little danger of that. In creating the soundtrack for Remember My Name, Alan Rudolph sought out 83-year-old retired (for 25 years) jazz great Alberta Hunter to write and perform nine songs for the film. It's said she has a brief walk-on in the film, but I've yet to catch it. Popular in the '20s & '30s, she enjoyed a late-career resurgence which lasted until her death in 1989. Anthony Perkins and Barry Berenson had been married about four years when they began work together in Remember My Name. Berry, the younger sister of actress/model Marisa Berenson, was a photographer and model herself. She and Perkins had two sons and remained wed until his death in 1992. Berenson died tragically at the age of 53, a passenger on one of the planes that crashed into the World Trade Towers on Sept. 11, 2001.